This program runs a one-sided auction in which sellers are located in separate local markets with multiple buyers. A trade treatment permits buyers to purchase from sellers in different markets, which creates a more competitive setting. Sellers post prices independently on a take-it-or-leave-it basis at the start of each market period or "round." Buyers then place orders at the posted prices. Such posted prices are characteristic of many markets where individual negotiation is not possible. This institution is often found where one side of the market is "thinner," as is the case with retail markets with large numbers of potential buyers. 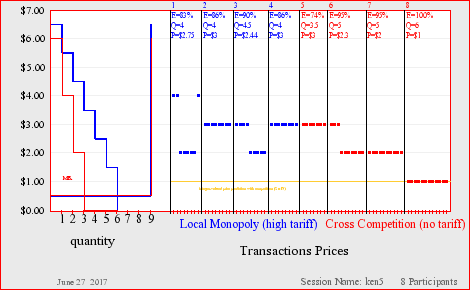 Class discussion can focus on the efficiency costs of trade restrictions that limit the extent of the market and create local monopolies. Market efficiency is measured as the fraction of maximum possible value created by the trading process, i.e. the ratio of the sum of all buyers' and sellers' earnings to the maximum possible value of this sum. Default parameters also facilitate a discussion of marginal revenue and cost for discrete units. Setup parameters include shipping costs and buyer and/or seller communication.